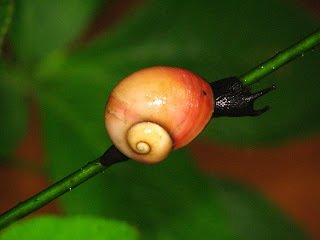 Land snails is one of the taxa that Sri Lanka has a very high diversity. A total number of 246 land snails has been recorded from the island so far.Out of that 218 species are endemic to Sri lanka. Prosobranchians have a single pair of tentacles while the Pulmonates have two pairs of tentacles.CaCo3 % in the Prosobranchian shell is higher than the protein %.Therefore the shell is much harder.Pulmonates have more protein in their shells.So they have softer shells. the shell opening when the snail's body is inside the shell) Pulmonates don't have an operculum. The snails that live mainly on trees are called tree snails.Sometimes they can be found in the leaf litter too.All the tree snails in Sri Lanka belongs to the family Acavidae. This Genus is endemic to Sri Lanka.There are 3 species classified under the Genus Acavus and all of them are comparatively large and colorful.These species has a very hard shell and normally they feed on fungus,mosses and degrading fruits. Acavus phoenix : Most common Acavus species.It has a rosy brown shell and a black colored body. The lateral edge of the largest ring of it's shell is round. A.Phoenix is distributed in the wet zone of the country. Acavus superbus : This species has a greenish shell and a rosy brown body. The lateral edge of the largest ring of it's shell is sharp. It's eggs has an average diameter of 10 mm. A.superbus is distributed in the South Western part of the Wet zone of Sri Lanka. The snails belongs to this genus are also large like the Acavus species but they have less conical shells with flat tops. Oligospira polei : This species has a orange brown shell and a white shell lip. The shell of the juveniles is yellowish. They live close to the ground. Oligospira skinneri : A shiny light brown/rosy shell with some small white spots on it. Lip of the shell is meat red. Oligospira waltoni : This species has a rosy brown shell with a dark brown lip.